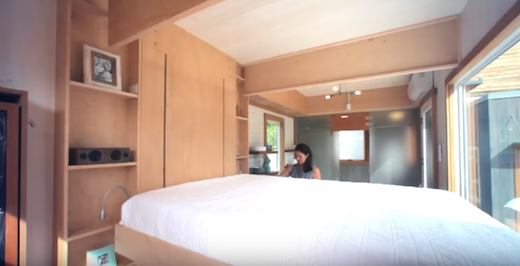 The tiny home builder Cubist Engineering, which is based in Greenwich, New York has created a very interesting tiny home, which has no standard bedroom. Instead, the bed is stowed away under the ceiling in the living room and lowered with the press of a button when needed. The so-called Sturgis is a 21 ft (6.4 m)-long towable home, and despite its very small size it is quite spacious. 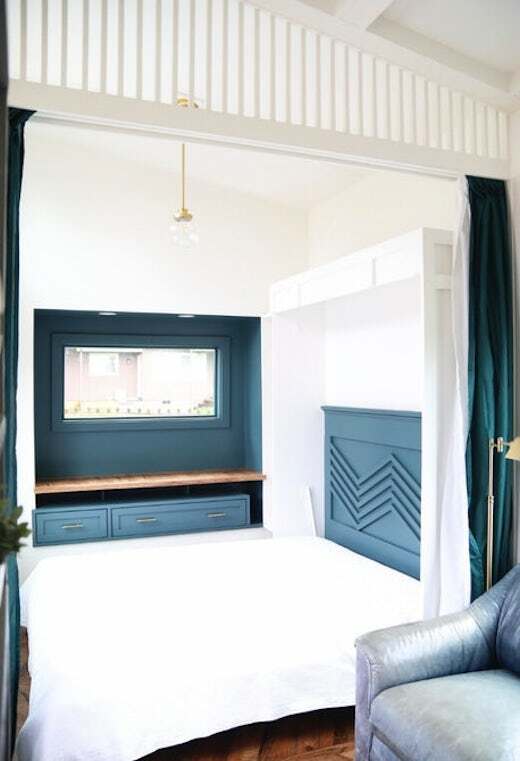 Most of the space is gained by not having a standard bedroom, but the rest of the layout was also carefully planned with maximizing the available space in mind. 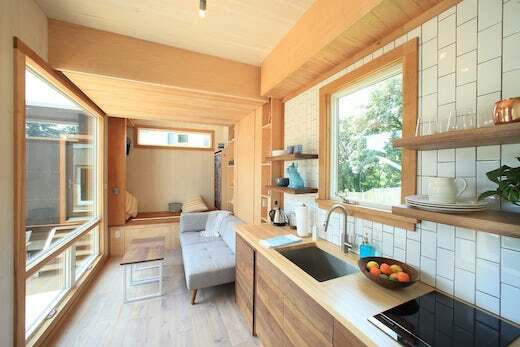 The Sturgis tiny home features a CLT (cross-laminated timber) structure, and has a cypress wood siding, which was treated by the Shou Sugi Ban method to preserve it and deter pests. The home also features a fiberglass roof. 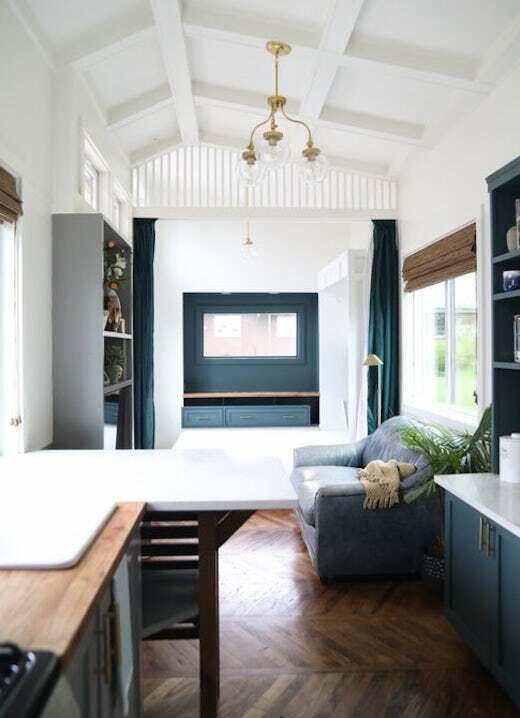 The home has a total floor space of 170 sq ft (15.8 sq m) and much of it is taken up by the living area, which is equipped with a modular sofa, some cabinetry, and a coffee table. The kitchenette is small but functional. It features a butcher block countertop, and a two-burner induction stove, while there is also enough space for a fridge and freezer. The bathroom is also quite small, but big enough for a shower, toilet and sink. The Sturgis has no lofts, the queen-sized bed is simply lowered down by the flick of a switch when it is time for bed. The mattress is supported by a steel frame, which is wrapped in maple. According to Cubist Engineering, the bearing and railing system used to raise and lower the bed is the same one that is also used to load fuel rods in nuclear plants. 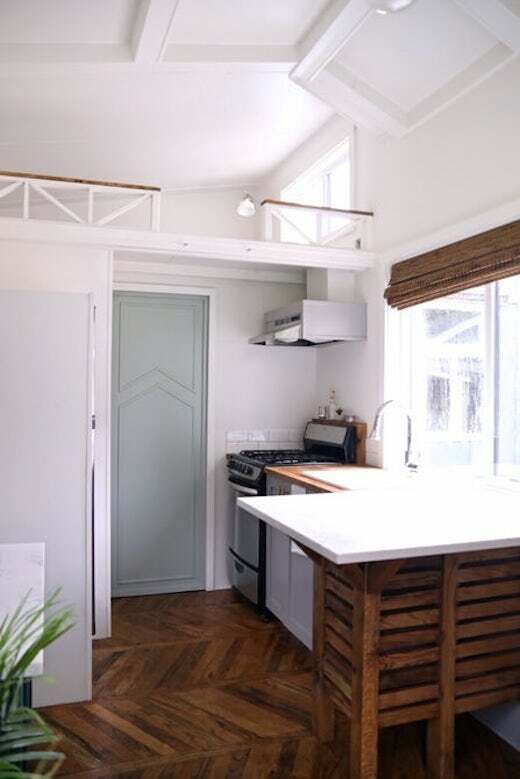 There is also a so-called “bonus space” in this tiny home, which was created by a raised space next to the living room. It can be used as a reading nook, or storage space and is big enough to store a motorcycle. It can also be used as a utility area, storage space, and more. This storage area can also be accessed from the outside via a gull-wing door that is operated by a remote control. 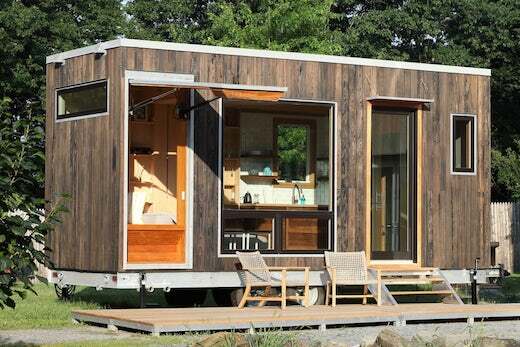 For power the tiny home uses a standard RV-style hookup, though a solar power system is an optional add-on to the basic version. Other add-ons include a rainwater collection system, an exterior deck, a security package comprised of cameras and motion sensors, as well as a remote management system, which allows for controlling the lighting, etc. using a smartphone app. The basic version of the Sturgis home without any add-ons costs $99,000. 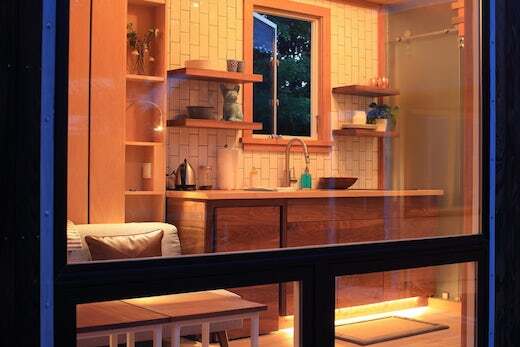 Apart from homes, the firm also offers different versions of this tiny dwelling, which are suitable as retail space, studios and more. 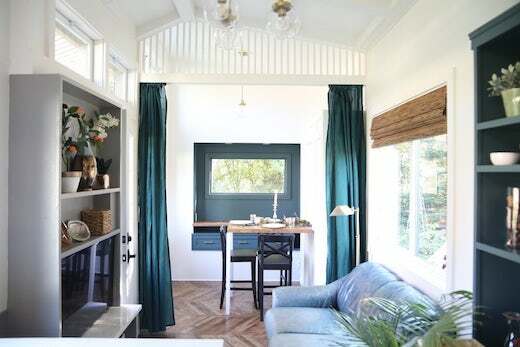 The recently completed Pacific Harmony tiny home, designed and built by the firm Handcrafted Movement, features superb craftsmanship and some unique interior layout ideas, which make it appear much more spacious than it is. This includes a bedroom, which can be turned into a dining room when needed. The Pacific Harmony home is towable, and measures 28 ft (8.5 m) in length. The exterior cladding is board and batten, with accents made of Pacific Cedar, while the roof is standing seam metal. Much of the interior is taken up by the living room, which is placed in the center of the home and fitted with a sofa, and a large entertainment center. One of the bedrooms is also located on the ground level, next to the living room. It features a folding oak dining table, which can be folded out of the way when not needed so as to make room for the Murphy style bed. On the opposite side of the home is the kitchen, which features a propane-powered four-burner range cooker and a fridge/freezer. There is also a built-in breakfast bar, which can seat up to three people. The bathroom is adjacent to the kitchen and features a shower, sink and toilet. 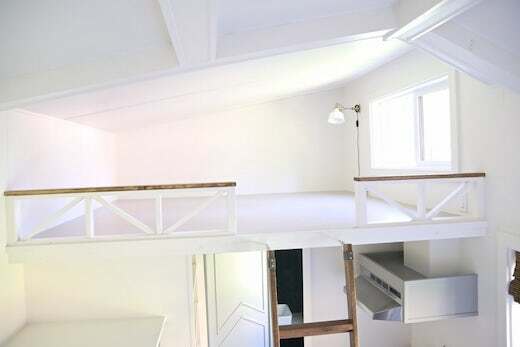 There is a sleeping loft above the kitchen, which is big enough for a double bed. It is accessible via a ladder which was made out of salvaged walnut. The flooring of the home is herringbone hardwood, while the countertops are made of quartz. 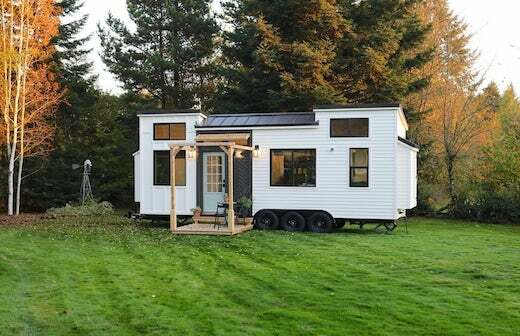 The tiny house gets its power via a standard RV-style hookup and has a propane-powered water heater. They also installed LED lighting throughout. There is also a small exterior deck, which is big enough for a table and chairs and needs to be taken off for traveling. The Pacific Harmony is selling for $79,000.